Tax season can be an overwhelming time for some. The stress of having to get everything organized, and itemized before the deadline can add on lots of stress. The only things that could be worse is finding out you’re being audited by the IRS. The chances of getting audited are low, but it’s still a possibility taxpayers should be aware of. In 2016, 1 million taxpayers were audited by the IRS. A tax audit is an accounting procedure where the IRS examines your individual or business financial records to ensure you filed your tax return accurately.It basically involves you and the IRS to carefully go back over your finances and tax records with a fine tooth comb. You will need to gather up all the financial documents the IRS is asking for and you may even need to hire a lawyer or tax professional to help you with this. Once you’ve submitted everything, you find that you have to amend your taxes or even owe the IRS more money. It’s a nerve-racking process that should be avoided if possible. Sometimes, the IRS chooses people at random to be audited. But in other cases, the things you do when you file your taxes can trigger an audit. 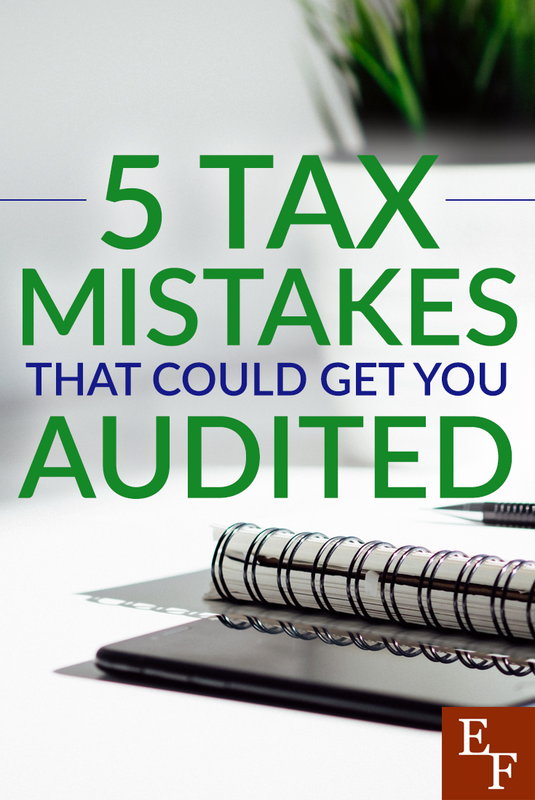 Here are 5 tax mistakes you want to avoid that could draw attention to yourself for an audit. It’s important to be extremely careful and precise when filing your taxes. You want to take your time and carefully review everything before sending it to the IRS. Even if you hire someone to file taxes for you, you still want to look over every detail of the paperwork to make sure simple things like basic math errors or incorrect social security numbers or your address is being avoided. You want to avoid errors large or small as much as possible and remember to attach all the appropriate form. It can be overwhelming which is why the more complex your tax situation gets, the more you may need to hire a trusted tax professional to help you organize and file everything properly. If the IRS notices something is missing or doesn’t match previous returns, they may feel the need to look into your situation more carefully. Another tax mistake that can cause the IRS to focus on auditing you is either leaving out income or forgetting to include it when you file taxes. The IRS matches data submitted by employers and companies via W-2 and 1099 forms with the information you submit regarding your earnings. If the numbers don’t match up, it could trigger an audit. Be sure to file all the income you receive for the year, even if you’re not sure it needs to be included. If it’s taxable, odds are, you need to include it. This also includes one-time payments likes prize money and royalties from product sales. If you have multiple streams of income, it can be difficult to keep up with all your earnings. So, I suggest tracking your income weekly or monthly in a spreadsheet. That way, you don’t have to risk going over everything at the end of the year and possibly missing something. Deductions can be a great thing to minimize your taxable income but you must know how to use them the right way. There are tons of expenses you can deduct and the list increases if you’re self-employed. But, you want to make sure you’re staying up-to-date with the tax code and only deducting what you’re allowed to. For example, you may only be able to deduct a percentage of certain expenses and you should aim for a double deduction by including expenses that you’ve already been reimbursed for. It can be a tricky situation, but again, tracking your expenses and income weekly or monthly is the best way to go to stay organized. Is being too charitable even possible? When it comes to filing your taxes, it can be if you are overexaggerating your donations in order to claim more deductions. The thing is, the IRS knows how much people at your income level tend to donate annually. So, if your amount seems like too much, they may question it. To avoid this, make sure you hold onto receipts. If you have to, make a realistic estimate instead of some unrealistic huge amount you’re not sure about. Businesses should be profitable most of the time. If you start a side business and endure a loss the first year that’s perfectly fine. If you continue to report a loss for at least 3 of the past 5 years, the IRS may wonder if you’re trying to avoid paying taxes. They could label your business as a hobby. Then you won’t be able to claim any deductions since the IRS disallows any business deductions for hobbies that you may try to claim on your Schedule C. Plus, you’ll probably get audited and can end up having to pay even more taxes. This isn’t being said to scare you away from entrepreneurship. If you are serious about running a business then you should already be motivated and dedicated to making it profitable. Say you’re luck runs out and you do get audited. Remain calm. The auditor will most likely recommend that you make a correction which could mean paying more money in some cases. You only have two options at this point. Either you can agree with the IRS that you need to make a change, or you can fight against it if you’re sure you aren’t in the wrong. You may want to hire a tax professional to help you make corrections. Or, if you feel the IRS is wrong, it would be best to hire a lawyer to help you fight their claims. The process can take a few months so be patient and diligent. Instead of hopping on the defense, you want to make sure all your paperwork is in and correct in the event that you did make a mistake when filing your taxes. Staying organized and responding promptly can keep the situation under control so you can reach a solution sooner. Have you ever been audited by the IRS? What are you doing to avoid getting audited?